On average, Canadians spend seven hours a day in front of a computer screen. I think I’m above average in this group, but even if I limited my time to less than seven hours a day I think I would find myself complaining of the common aches and pains that come with desk work. Almost 70% of people complain of back pain, and then there are those who experience neck pain, or issues with their wrists and elbows. Most of these complaints are due to working without the proper equipment. Lumbar support, wrist supports and foot rests can all help position your body properly to avoid injuries, and Fellowes Canada offers all of the above plus more. 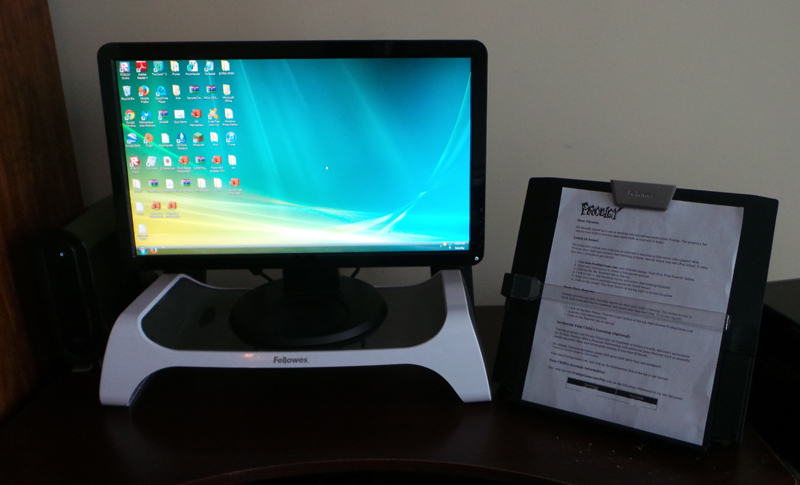 I received the I-Spire Series Monitor Lift and the Professional Series In-Line Document Holder to help get my workspace in order. The Professional Series In-Line Document Holder works for almost any size document or work space. It slides both up and down to adjust for longer paper sizes and has a magnetic guide that holds the document in place. It has a strong weighted base and can hold large documents. It adjusts to several angles as well. 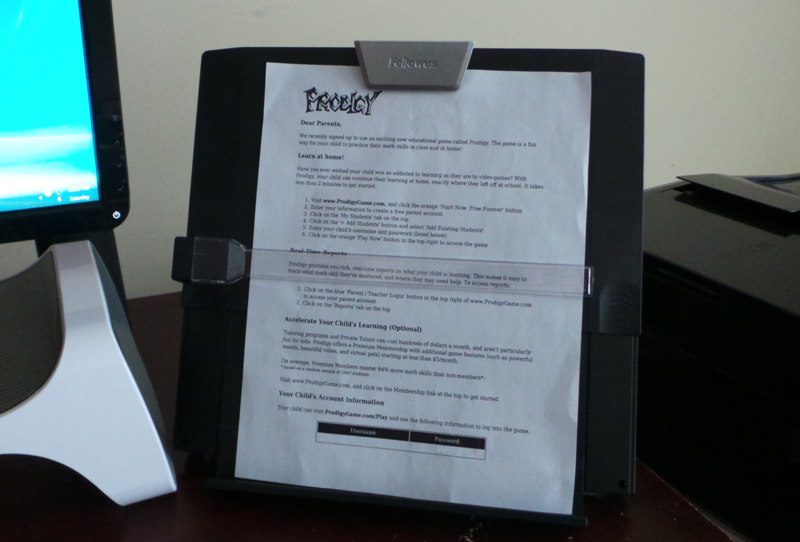 I set the Professional Series In-Line Document Holder up next to the kids’ computer because they often need to do school work that references books or papers provided by their teacher. Now they not only can have their instructions right where they need them, they also won’t lose them! 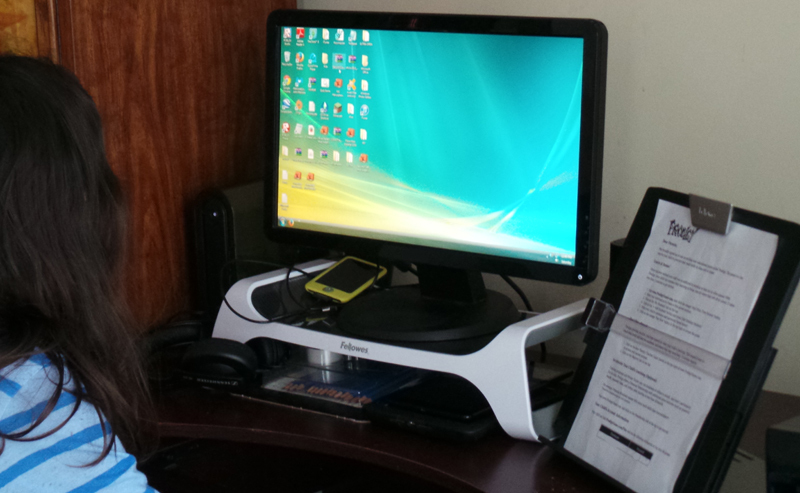 I also set up the I-Spire Series Monitor Lift at the kids’ work station. The I-Spire Series Monitor Lift allows you to place the computer monitor at the right height for your eyes. This helps to avoid neck strain from looking down at the monitor, and you can see by the photo below that it is at the right height for my 10 year old daughter (and me, since we are approximately the same height). It also allows us to use all of the desk space because we can store items under the stand. One of my lucky readers will win a complete Fellowes I-Spire Prize Pack (includes: Monitor Support, Mouse pad wrist rocker, Keyboard wrist rocker, Lumbar support, Document Lift, Foot Support. VALUE: over $200). Not enough space for me which in turn causes me to be unorganized at times. Moat common complaint about my office space…and my co-workers,,,not enough room. The space is awkward no matter how you re arrange it. I could REALLY use this prize pack. Have had to visit the chiropractor 2x weekly throughout January due to severe back pain. Not enough room or storage! I would like a decent office chair. My complaint about my office space is that my desk chair doesn’t work out for the proper placement of my arms for the best use of my keyboard. My mouse shelf is falling off the keyboard shelf….bad setup in the first place! To small and need to be better organized. It’s too small. My chair is too big and the desk is too small so it’s very cluttered. My biggest complaints are space and uncomfortable chairs. I do not have enough space or much storage. i dont have enough light in my office space. or a chair that’s comfortable enough. The lighting in this office is next to nil. I have a desk lamp on my desk and that is what I use. There is no overhead light. My computer screen is too low. Right now, I would say that my workspace is not as well organized as I would like it to be. Sitting wrong gives me a sore back , plus i need more space! Small space so no organization,or proper seating! It’s poorly laid out – the outlets aren’t where I need them! Small space and lack of storage. Not enough space or other desks are too messy! My biggest complaint is lack of space. My most common complaint about my office space is not having enough room for my notes and papers. Not organized enough and too little space. Definitly not enough space 🙂 Thanks for the great giveaway. My issue is comfort & space.. guess I have 2 big issues. Ha! My office space is in the truck- so it is usually bouncing down the road! My issue is comfort. I could use I-Spire Series™ Monitor Lift and all the other items as well. Nice prize. Mine is the kitchen table so I am constantly having to move my stuff! I don;t have enough room and storage/filing room. Lack of space and organization. My biggest issue is there is not enough storage area within reach – so that I can get at my files, binders etc. easily. Very uncomfortable chair! Not great for my back. I have two complaints about my office. First one is space. As soon as I saw the Document Lift I was like…”Oh Yeahhhh…perfect. I have papers from one end of my desk to the other. The lift is the pefect solution. I also suffer from carpal tunnel so the wrist rockers are very important. Thanks for the fab giveaway. The problem I have with my space is that it is cramped, small and it barely has space for any of my things. I need more desk space to work. Too much clutter since several people use the same area! The most common complaint about my office space: the mess! the disorganization!! The most common complaint about my office space is that I dont have everything leveled out properly at my desk and my back hurts from it. My desk area is too small and gets crowded easily. It is close to server room what is not good, my previous spot was taken new manager. The lights hurt my eyes. my chair is uncomfortable and messy desk with no organizatiom. My most common complaint about my office space is that it is not ergonomically sound. I have neck and shoulder pain from looking down at my monitor as you mentioned. Plus, I could really use an ergonomic keyboard. My most common complaint is how messy my husband has made the computer area since he retired – way too many papers around that I think should be recycled. Sigh. I need more organization – thanks! The mess my husband leaves all over it. My complaint is Nothing is organized in my office. no organization but in my own space. My office space is unorganized and not very practical. I could defiantly use some help from Fellowes Canada! Thanks for a great review and giveaway! That I don’t have a proper one, I have a shelving unit that holds my computer…… Oh retail life how I loath doing anything on my shelf desk. My most common complaint about my office space is that is unorganized and my chair is uncomfortable. That I dont have enough room to organize everything properly so everything is kind of all over the place with no order at all. I waste a lot of time looking for things. Well, there are a few: my shelves are very cluttered, it needs much better light, and my back and neck get sore from leaning forward over the desk area to use the computer. My uncomfortable chair and my screen not being at the right level. Very disorganized. Would love more cabinets and a really comfy chair and bigger work area. I’d live to win this and set up with our den computer. Too much clutter. Kids invade my space and leave their things around. There isnt enough space for all the paperwork and also I would love a foot rest under the desk. Lack of space and could use a better/comfortable computer chair. This looks like a great prize. It would make a nice gift for my young cousin. there is no room around the computer to put papers, take notes, etc. barely room for the mouse! Too small of a room! My biggest complaint is that it is cluttered and cramped. Never quite enough space. Lack of space. I only designated a small corner in the basement during the renovations, now I regret it. I have nowhere convenient to put my printer. OMG I have looked for a monitor life for forever – I thought they had been discontinued in this laptop/tablet era as I haven’t seen one for as long as I’ve been looking. My biggest office complaint is the height of my monitor especially because I’m tall and we have poor lighting options! My computer table is too small. 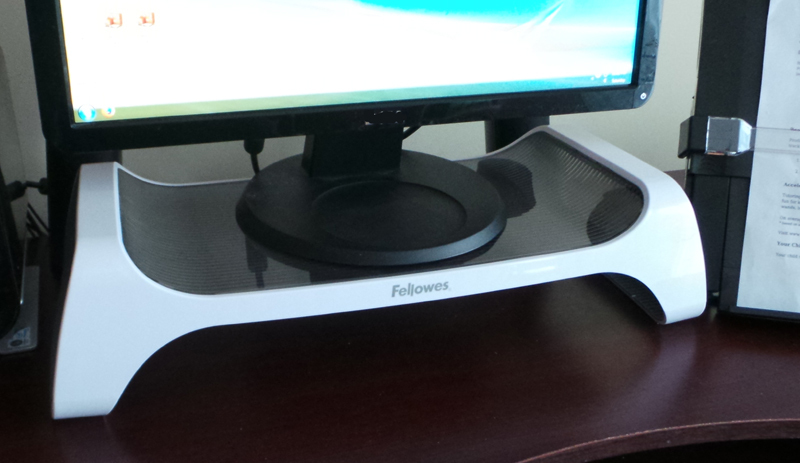 I don’t like the way the monitor sits on my desk ,should be higher. My complaint for the past 7 months has been that the bathroom renovation/repair supplies are housed in my office space. Hard to stay focused when there is a tower of boxes and a tub beside you. It’s too cramped and small. I have real trouble keeping it clean and organized! My desk is disorganized and my monitor height needs to be adjusted. That I had no office space!! My most common complaint about my office space is that my desk is not big enough which at times can lead to a bit of chaos! I get wrist and neck cramps. My complaint about my work space is my chair! it has a mind of it’s own and constantly readjusts the height I set it to whenever it feels like it. That we dont have an office!! Our desk is in the kitchen! It’s dark and my back hurts after sitting in front of computer for an hour. My office space is shared between too many people of different heights. Components will come in handy. too congested, leaving no room for office supplis need!
. OMG. Wow, prize pack is fab. & splendid. 2 fingers snap. It is tight, fly & off the chain. Thank you for the awesomeness, the contest, and generosity. Pick me, pick me! Dear Santa: I’ve been nice. My X-Mas wish this year is to win this contest. Starving artist here desperately needs the prize pack to work and eat again. My office space is too small.